Since the establishment of HCS in 1998 by the Christos and Mary Papoutsy Charitable Foundation, the site has been visited by tens of millions of visitors. We at HCS would like to thank all persons for information submitted to HCS and especially our contributing authors for their excellent submissions covering a variety of topics of interest to the Greek-American community. Articles or information posted on the Hellenic Communication Service website may not necessarily reflect the views or philosophies of the site's editors or publishers. Submissions to HCS may be edited or changed in any manner without notice. SEARCH SITE: Search HCS using Google site-specific search engine. 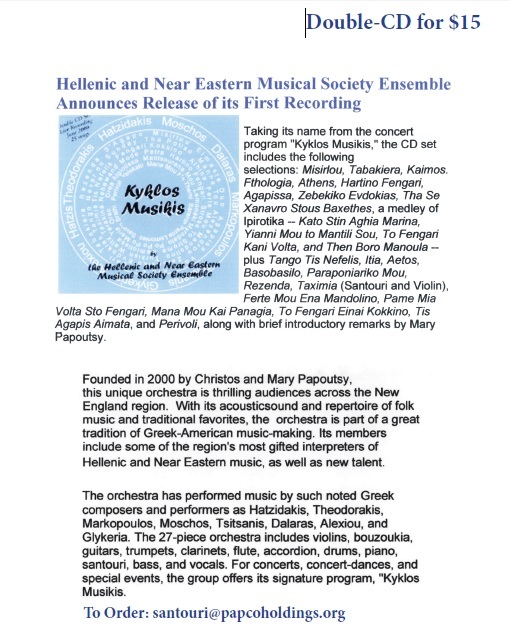 Type in keyword(s), leave one space, type in "site:www.helleniccomserve.com" , click on "Go." NEW WEBLOG, The New Athenian, providing independent coverage on Greece and the surrounding region by John Psaropoulos at http://www.thenewathenian.com . Tax Returns in Greece by End of June 2016--by Christos Iliopoulos, Esq. Validating a Foreign Court Decision in Greece--by Christos Iliopoulos, Esq., Attorney at the Supreme Court of Greece, LL.M. 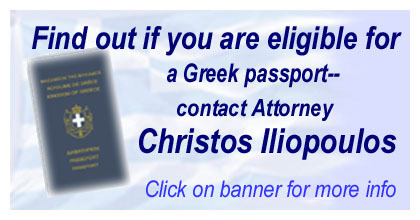 If No Will in Greece, Who Gets What?--by Christos Iliopoulos, Esq., Attorney at the Supreme Court of Greece, LL.M. How to Go About Buying a Plot in Greece-by Christos Iliopoulos, Esq., Attorney at the Supreme Court of Greece, LL.M. Inheriting in Greece--by Christos Iliopoulos, Esq. The John C. Rouman Classical Lecture Series at the University of New Hampshire Announces a U.S. Lecture Tour by Dr. Ioannis Kourtzellis of Mytilene, Greece. Click here to view and download tour brochure. Greek Institute of Cambridge Announces Lecture by Author Christos Papoutsy: "Ola gia ta paideia--Everything for the Children"
New Book Authored by Papoutsy: Everything for the Children. . . At the Expense of Whom? Dance of Zalongo History Revealed in New Book by Christos Papoutsy. 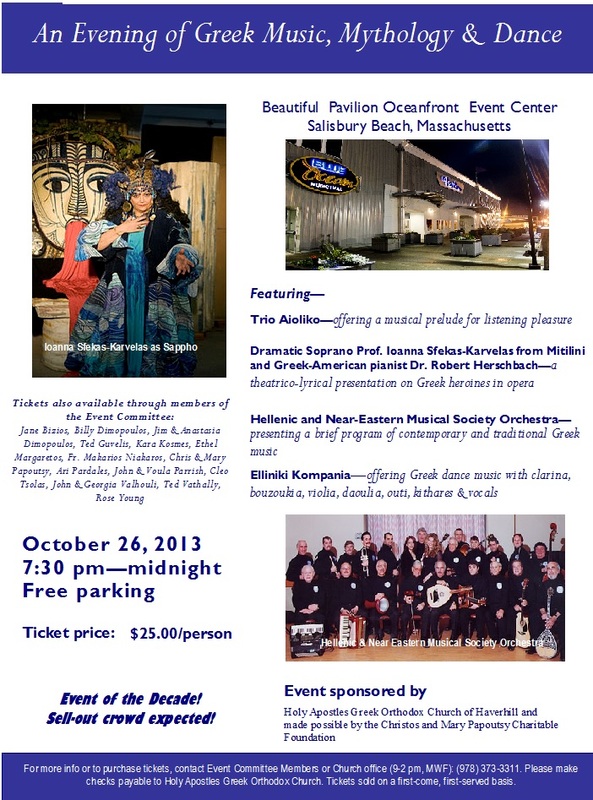 Click here for small JPEG flyer (110KB--set printer to "landscape" format). For full-size flyer (PDF 5.3MB), click here. St. Methodios Faith & Heritage Ctr Open House. Contoocook, NH. Celebration of the Feast of the Elevation of the Holy Cross. Blessing of the Waters and Diving for the Cross, Family Barbeque, Dedication and Blessing of New Cabins, Alpha Omega Soccer Field, Open-Air Pavilion. Free parking. Saturday 17 September 2016. 16th Annual Metropolis of Boston Golf Classic. Andover Country Club, Andover, MA. Afternoon Tournament beginning with lunch and ending with dinner. Sixteenth Annual For the Children event. For more information visit the URL www.campgolf.org. Monday 26 September 2016. Lecture by Dr. Richard Hunter, Regius Professor of Greek at Cambridge University, UK. Event location: University of New Hampshire, Durham, New Hampshire. Hosted by the John C. Rouman Classical Lecture Series at the University of New Hampshire, the College of Liberal Arts at the University of New Hampshire (UNH), and the Department of Classics, Humanities, and Italian at UNH. Lecture free and open to the public. Additional details to be announced. 7:30pm Wednesday 5 October 2016. Post your wedding or your child's christening on Hellenic Communication Service!